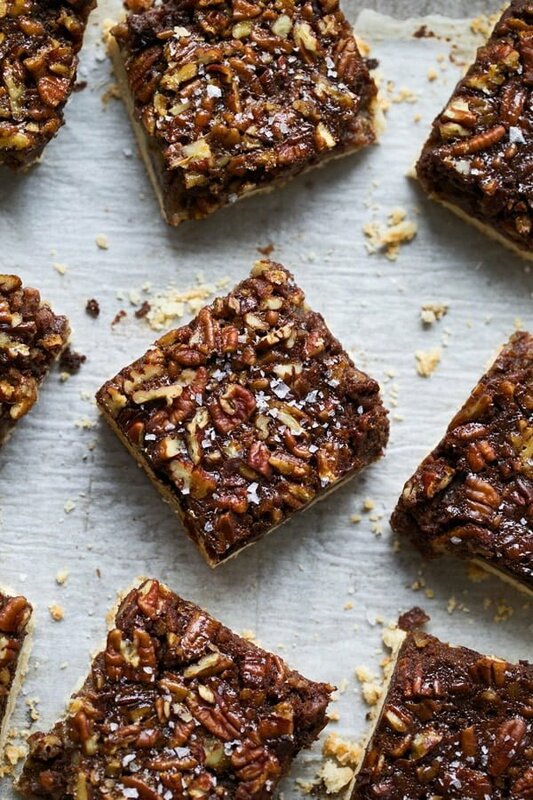 These Brown Butter Chocolate Pecan Bars have a layer of salted shortbread, followed by a layer of rich (also salted!) chocolate filling and are topped off with a bourbon-infused brown butter pecan filling. 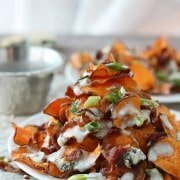 They’re rich, delicious and perfect for your holiday table! It literally blows my mind that Thanksgiving is one short week away. I mean, how?? While the weather around here definitely reflects the upcoming holiday, my mental state is nowhere near ready for the holidays to come and go. It seems as quickly as they begin, they’re over, so I plan on staying in a perpetual state of holiday bliss from now until eternity. I’m planning on making that happen by soaking up the season as much as I can with constant Christmas music, obscene decorations and flooding the Internet with as many holiday recipes as I can crank out. 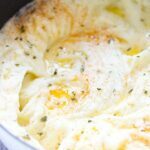 We’ve been on the Thanksgiving track for weeks now, and I’ve shared multiple recipes for your menus like these mashed potatoes, stuffed acorn squash, and this mashed cauliflower, in addition to the plethora of recipe I have in the archives, BUT I’ve yet to share a dessert recipe. This isn’t entirely by happenstance, since desserts aren’t typically my expertise when it comes to recipe developing, but I’ve been craving pecan pie something fierce as of late, so I set out to make a version completely tailored to my liking. 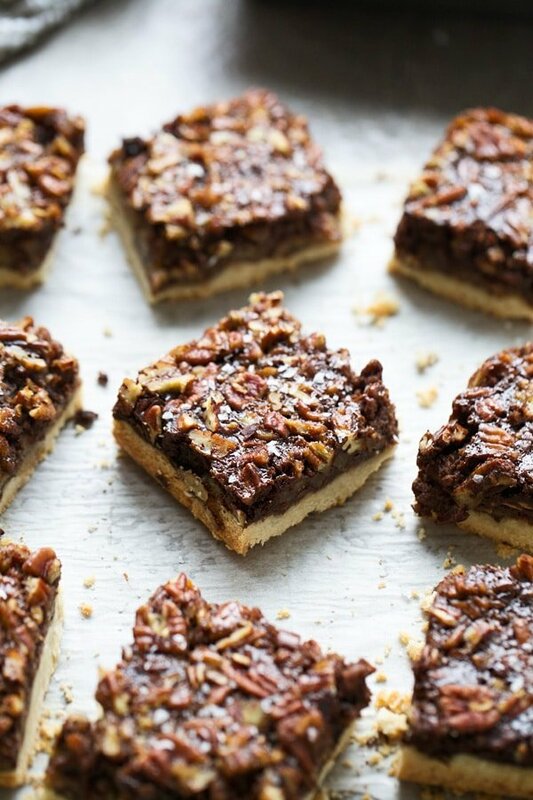 Instead of throwing together a traditional pecan pie (Because what fun would that be? 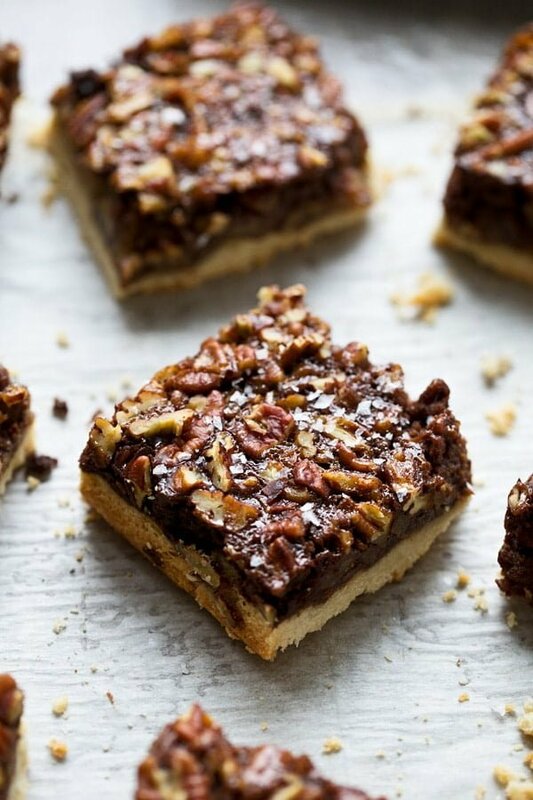 ), I took the classic version, fancied it up with bourbon and brown butter, layered it on top of a rich chocolate filling and a buttery shortbread crust for a bar that may just rival even the most delicious of bakery pecan pies. Now I’m not one for cloyingly sweet desserts so these guys have the perfect balance of sweetness for me, but don’t worry, it should still appeal to those with a generous sweet tooth as well. Just as all pies begin, this one starts with crust, specifically, a thick layer of shortbread crust. The recipe I used is an adaptation of my Mom’s friend Susie’s famous shortbread cookies. As written, it produces a pretty sturdy cookie, and while I did still want the cookie base to be solid enough to hold the filling, I also wanted it to be sort of soft, so I pared down the amount of flour to reflect that. 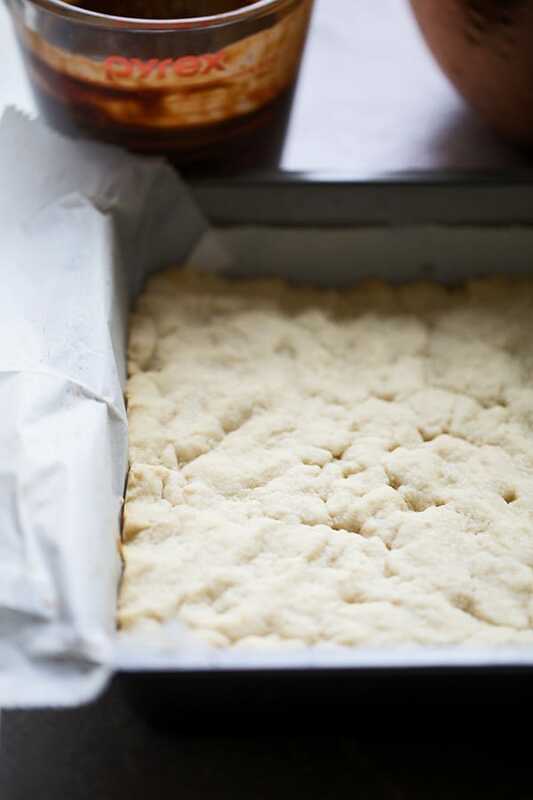 Shortbread crusts are one my favorites simply because there’s little room for error. You just throw the butter and sugar in the stand mixer, beat it into oblivion and then add in almond extract and flour and gently mix until it’s combined. It’s pressed into a parchment-lined pan and popped into the oven while the other components are put together. So the chocolate filling is super simple. I wanted it be almost chocolate ganache-like, so really dense and rich. Because the filling had to bake along with the pecan filling, I tried to mimic the texture of a traditional chocolate ganache with cream and semi-sweet chocolate and then add in a egg to bind everything together, which still retains that ooey gooey chocolate factor after baking. The pecan filling is pretty standard, except instead of simply using melted butter, I took the extra step of browning the butter to add in even more flavor to the mixture. Also bourbon, because why not?? To compliment the nutty pecans and brown butter, I used brown sugar (light or dark will work) instead of white, something I almost always do around this time of year. Corn syrup gives the filling that standard pecan pie texture and a pinch of salt helps to balance out all the sugar. Once the crust has cooled slightly, the chocolate mixture goes in, followed by the pecan mixture next. Don’t freak out if the two layers seem to be mixing together, that’s supposed to happen. Essentially what will happen in baking is some bites will have separate layers of pecan filling and chocolate filling and some bites will have the two combined, which I love. After the bars cool completely, and I mean COMPLETELY, they’re cut into squares, sprinkled with flaked sea salt and ready to be served. If you take them out and try to cut them before they cool completely, they’ll still be absolutely delicious, but they will just fall apart in your hands, so beware. 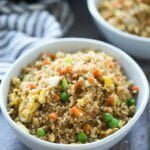 These lasted us three days before they were gone and they were every bit as delicious the third day as they were the first, so they’re a great item to make ahead of time. 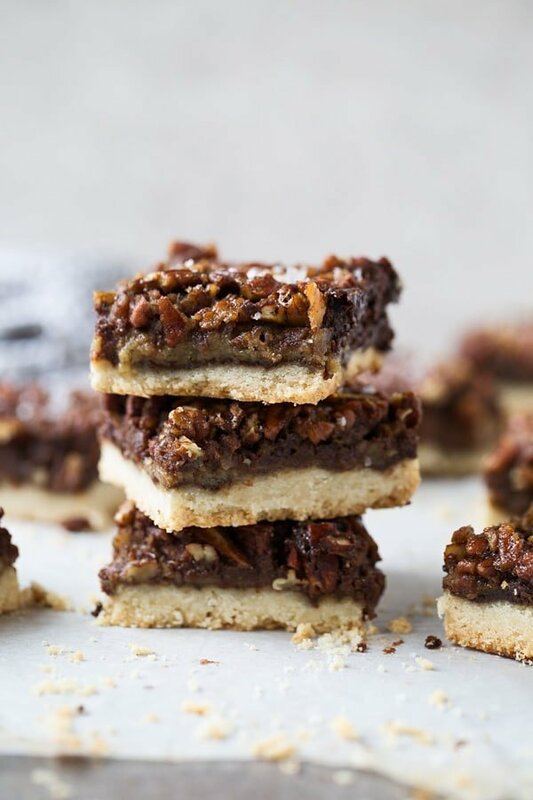 These Brown Butter Chocolate Pecan Bars have a layer of salted shortbread, followed by a layer of rich (also salted!) 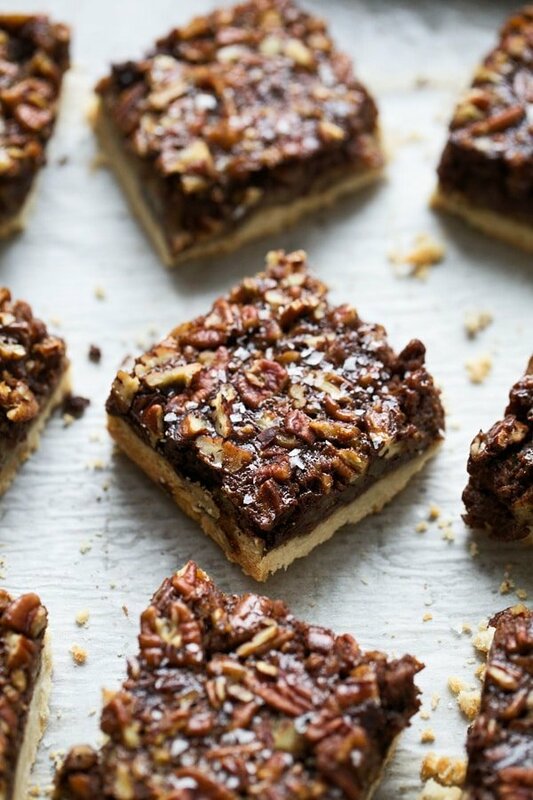 chocolate filling and are topped off with a bourbon-infused brown butter pecan filling. 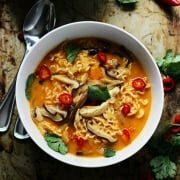 Rich and delicious! Preheat oven to 350 degrees. 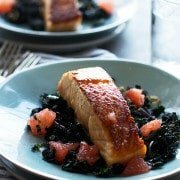 Grease an 9x9 inch square baking pan with non-stick cooking spray. Line with parchment paper. Add softened butter and sugar to the bottom of a stand mixer. Beat on high until fluffy, about 3 minutes. Add almond extract, beat until combined. Add flour and salt. Turn the mixer on low and add flour. Mix on slow, then medium until combined. While the shortbread bakes and cools, make the pecan and chocolate filling. For the chocolate: Add heavy cream to a small saucepan. Heat until simmering. Remove from heat and add chocolate. Whisk until combined. Cool slightly. (I make the pecan filling while the chocolate cools.) Whisk in egg, then add in salt, gently whisk in. Add 1/2 stick butter to a small skillet. Turn the heat on medium-high and melt butter. When the butter starts to turn brown and smell nutty, swirl the pan. Continue to swirl the pan until the butter is a deep brown color. Transfer to a small bowl to cool slightly. For the pecan filling: Add corn syrup, brown sugar, bourbon, eggs and vanilla to a medium bowl. Whisk to combine. Add melted brown butter. Whisk to combine. Add pecans and pinch of salt. Toss to combine. 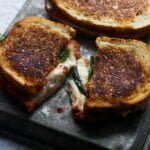 Once crust has cooled slightly. 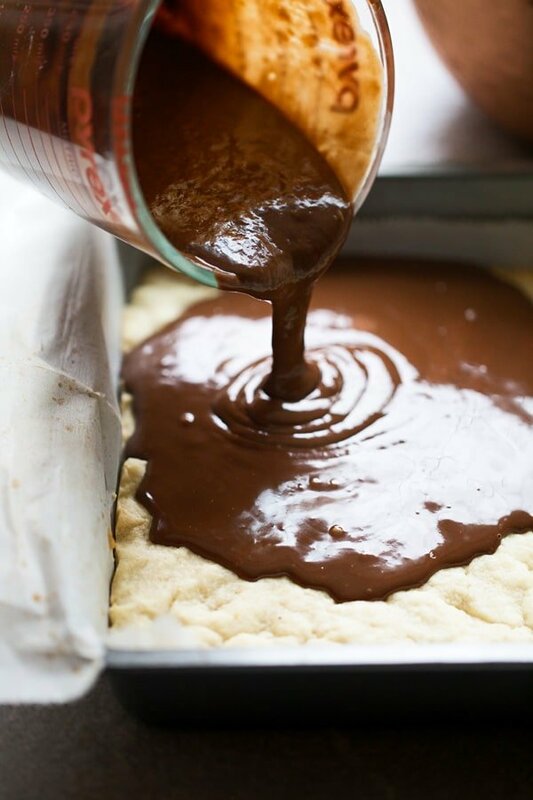 Pour chocolate layer into the crust. Use a spatula to smooth over. Pour pecan mixture on top. Smooth over. It's ok if the two layers mix together slightly. Place in the oven and bake for 40 minutes or until the top is set and a toothpick inserted into the bars comes out mostly clean (there of course, will be a little bit of chocolate attached). Cool completely. Lift bars out of the pan and use a very sharp knife to cut into 9 squares. Garnish with more flaked sea salt. 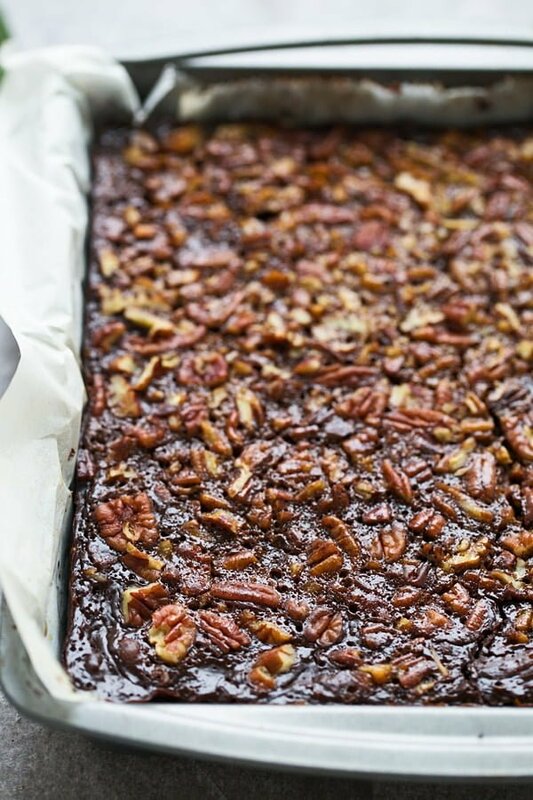 6 Responses to "Brown Butter Chocolate Pecan Bars"
Had your samples!!! Seriously Great!!!!!!! How Much Flour in the shortbread crust?? Making right now!! I am so sorry Devin, it’s two cups! !